Missya1, Looking at your stats, It would seem you are getting a pretty decent speed, Based on your distance from the BT Exchange. 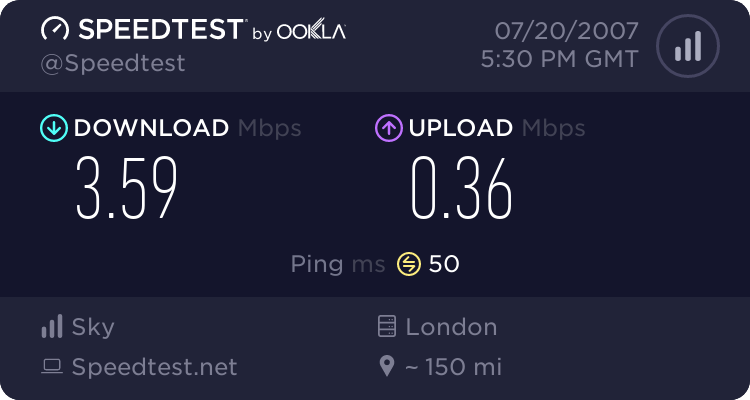 You could possibly get a little bit more, But if you are currently having a stable connection, Then I really wouldnt want to start fiddling. Post detailed connection statistics, See - DG834GT - Select "Get Detailed Modem Statistics" follow the instructions and post the contents of the output file in this thread. Have a read of - http://www.skyuser.co.uk/forum/speed...explained.html that explains all the info about, Noise Margins ect. Moving over to Mid will save you £5, But you loose the freedom of the "Unlimited". As pointed out, your download speed would remain the same but your upload speed would drop to 416! Also if you go to mid then you have a 40GB cap! If you don't need the extra upload then I would downgrade, after all the 40GB cap is more than enough unless you download loads of movies and mp3's!!! At the end of the day it's not a case of it being just a fiver!!! you could save £60 a year! If your with sky BB for the next five years then thats an extra £300 in your pocket!